You'll notice on your character screen how much ranged (arrow head) , physical (sword hilt) and magic damage (wand head) your character is performing. This damage is basically summed together and multiplied by a percentage to yield the average damage per second your character is performing. 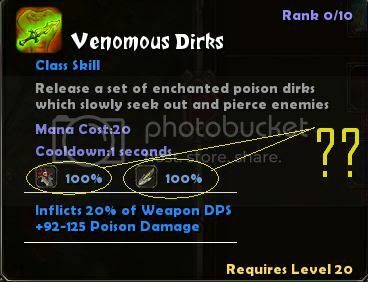 For example, let's pretend you're using the skill 'Venomous Dirks' and your character is capable of dealing out 10 points physical damage and 200 points of ranged damage. The calculation of actual damage done would, therefore, be: ((10*1)+(200*1))*.2 + 92 to 125 poison damage = 134 to 167 points of damage per second. As for the 'Hamstring' skill, this calculation involves magic damage and ranged damage (and no physical damage), so let's pretend your character is dealing out 200 points of ranged damage and 200 points of magic damage. The calculation is now: ((200*.5)+(200*.5))*.05 + 83 = 84 points of damage per second. I'm pretty darned sure that it is the Attribute value for the pictured attribute that contributes to Skills with % icons, rather than the much larger melee, ranged, or magic damage range numbers. First of all, I read it that way in a post from Travis way back - which I cannot currently find. But, secondly, note that the damage number is not a fixed value from which to derive a stable 50% or 100% value consistently. Not insurmontable, but 'feels' wrong. I'm pretty darned sure that it is the Attribute value for the pictured attribute that contributes to Skills with % icons, rather than the much larger melee, ranged, or magic damage range numbers. First of all, I read it that way in a post from Travis way back - which I cannot currently find. What do those infos mean on the skill description? Re: How about some freaking answers?!?!?!?! The little icons with the numbers next to them in skills basically tell you what % investment in that statistic ( sword for str, arrow for dex, and so on - the icons match the ones in the character sheet ) will modify the skill. The modification can be spread across multiple effects on the skill, or one - depending on the skill and the effect. We toyed with ways to show that per value on each individual effect in a skill, but it was such an absolutely unreadable mess - such a DENSE block of information, that it was really pretty unworkable. For example, let's pretend you're using the skill 'Venomous Dirks' and your character is capable of dealing out 10 points physical damage, 200 points of ranged damage as per the base weapon damage and your weapons DPS is 300 points. You've invested 5 points in STR and 25 points in DEX. The calculation of actual damage done would, therefore, be: (300)*.2)*1+(.05+.25) + 92 to 125 poison damage = 168 to 197 points of damage per second (the percentage modifiers are causing a bit more damage than my initial calculation - every characteristic point increases the damage by 1% ). 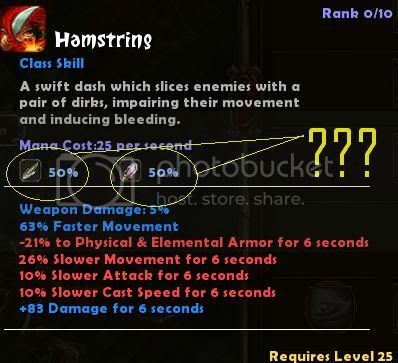 As for the 'Hamstring' skill, this calculation involves magic damage and ranged damage (and no physical damage), so (as per above) let's pretend your character is dealing out 200 points of ranged damage and 200 points of magic damage as per base weapon damage and your weapon DPS is 300 points. You've invested 10 points in MAG and 25 points in DEX. The calculation is now: ((200+200)*.05)*1+((10+25)*.5 + 83 = 121 points of damage per second (the percentage modifiers are causing a bit more damage than my initial calculation - this time every characteristic point increases the damage by .5% ). In each case, it appears the base weapon damage plays the greatest role in determing the total damage done, though the percentage modifier gained by characteristics helps nicely. Yow Perictione, Dreamrider . thx for info dawg ill just do a experiment my self i guess ,on both. Now that's the wisest thing you can do, Copyninja. It's a game; it's meant to be fun... not a headache!